With a bandaged bleeding David Wenham on the cover, this dvd seemed like a sure-fire blood and guts western classic. I'd not heard of "Five Guns", but I thought it would be worth a shot. Strangely enough, David Wenham wasn't listed in the credits on the bottom of the cover and doesn't appear in the film in any way, shape or form. "Five Guns" is a misleading moniker for this Les Mayfield directed 2001 western. Its real name is "American Outlaws" and it stars a young Colin Farrell as Jesse James, the famous bank robber. Great going korean dvd maker you've put the wrong star on the cover and made up a different title for the movie you're selling! If only you put a blurry photo of Jon Voight (also not appearing in this film) on the back, then you'd have the hat trick... What? You did? Thanks dvd maker, you're the best! Bearded Jon is the one on the right. 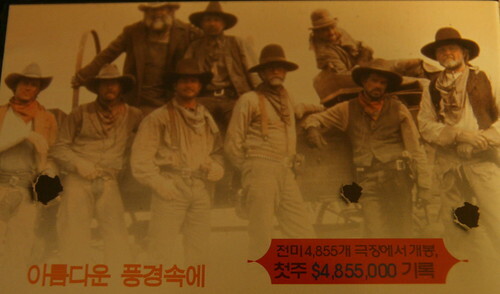 While I couldn't find the same picture on the internet, it seems that this photo of Angelina Jolie's father may well come from "Return to Lonesome Dove", but I have no substantial proof. However, I can confirm that Jon Voight does not pop his head into frame during the whole of "American Outlaws", shame really as he might have made this rather turgid western a little more exciting.